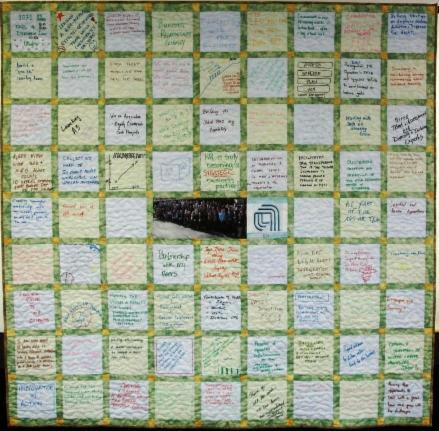 Gallery 2011 - 12 - The Joyous Quilter - Quilts and Patterns For Sale, Commissioned Quilts, Quilt Gallery, Quilting Tips & Tricks, Quilting Green and more! 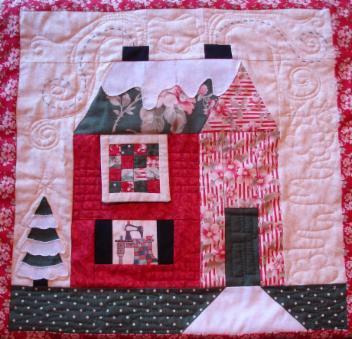 Here is the third of the four page picture gallery to show my journey of completed quilts for you to browse and enjoy. Some are commissions, some became treasured gifts to friends and family and a few remain in my possession. Finally I finished it! Yeah! 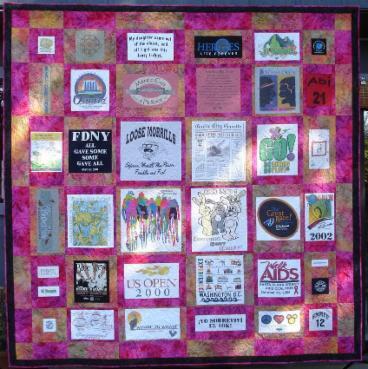 Part of the motivation is as a fundraiser for our Guild, myself and my three quilting buddies (The Four Fat Quarters!!) held a class to teach the Stack & Whack technique, so I was determined to get mine finished as an example! About time as it's been nearly two years in the making! I completely changed my mind about what I was going to do in the borders for this quilt....as you do! Originally I was planning to do undulating flying geese and, although I made the paper piecing templates, it just wasn't 'talking' to me! I realised I approach quilting like cooking - I look at what I have available in the leftover pile after making the featured part of the quilt (like looking in the fridge to see which ingredients are there) and then get creative! 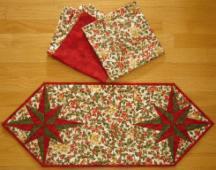 I am better at this in quilting than cooking though so it's a good job my hubby does most of the cooking! 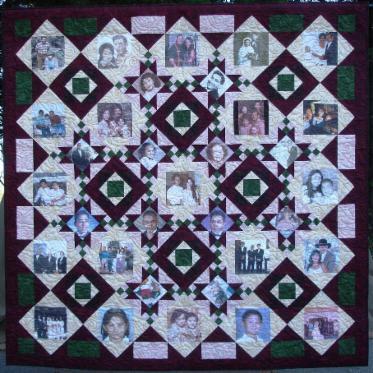 For this quilt the fabric is directional and I had one panel which was wide and one that was tall and slim. 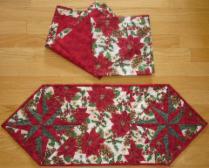 I thought about cutting both on the diagonal to make offset borders - not so easy on a piece that is 73" tall! My tip; mark the line to cut first! Then I was going to fill in around each piece with the black background fabric. Although the background fabric has little Koi carp in a charcoal color on the black, I felt that this would be an awful lot of black, so the idea of adding the Chinese characters came to mind....they say 'Courage', 'Grace', 'Love' and 'Happiness'. As a background for these sections I used a fish scale print that I discovered I had in various color ways (funny how that happens!) and auditioning them all, I found the dark gold to be the best. I was rather pleased with the result and at 84"W x 95" tall I have the perfect wall to hang it on the stairs. My brother's birthday is soon and I decided to embroider him a birthday card! He's always loved motorbikes and this was a nice embroidery I thought. I also made one for my sister-in-law and two nephews but, unfortunately, I forgot to photograph them before sending them off! Here is a wallhanging (12"w x 40"h) in which I used three of the Sashiko designs I have already made (see Projects in Progress below). I needed to make a donation for the annual fundraiser for the local art group to which I belong www.aromashillsartisans.com. The Japanese character in the bottom right means 'Harmony". 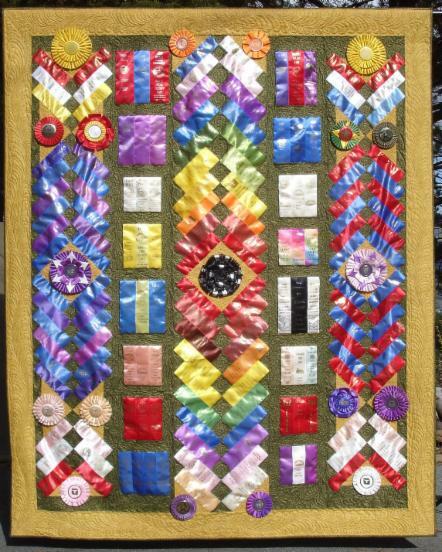 I was experimenting with making this wallhanging; I am planning to make several different kinds of wallhangings. For a while I have been longing to do some fabric landscapes and finally I got around to it! It was terrific to be able to create the image with complete freedom to do whatever I liked to achieve the look with which I was pleased. The inspiration for this one came from some of the spectacular Californian sunsets I've seen. There is a tiny swarovski crystal as the evening star and a flock of migrating geese to complete the picture. This piece was inspired by the front cover of Via magazine which had a striking image of the enormous cactii growing in the Arizona desert. My adventure with fabric landscapes coincided with a dear quilting friend having a clear out of her stash and bestowing me with numerous fabric treasures! Lucky me! As a surprise to her I thought that I would give this one to her as a "Thank You" gift - she was so surprised and delighted and it now hangs in her living room. I found the perfect sky fabric in the quilt store I work in and all the other fabrics came from my generous friend and they were just so perfect! 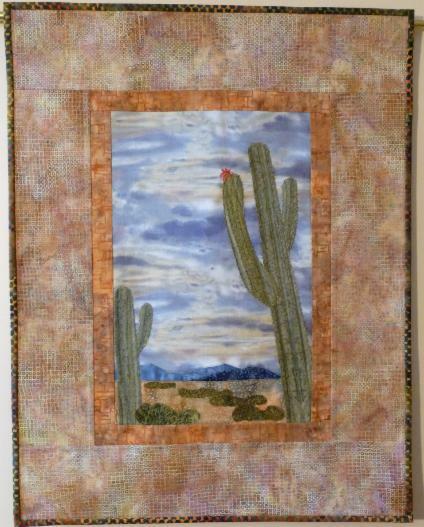 I used rayon embroidery threads with blind hem stitch to create the illusion of the cactus ridges and spikes. I also used them to thread paint the bushes and the cactus flower - the latter with a little artistic licence as I have no idea what the flowers of this behemoth actually look like! I topped the flower off with a swarovski crystal for a center piece.